Black rear brake line clips - ??? Hey guys... I can't stand my white rear brake line clips, especially now with the black swingarm. Anyone know of a part number that swaps over from another bike? Anyone know of another Honda model that uses black brake line clips that we can retrofit? This does not directly address your question, but what about taking your stock clips and using a fine wire as a hold, dip them in the black liquid plastic or "Dip It"? A couple of coats should do? Just a thought. Plastic dip tool coating also comes in an Aerosol .. set those clamps down on a piece of card board and they could be black in 30 sec, dry to the touch in a few hours. 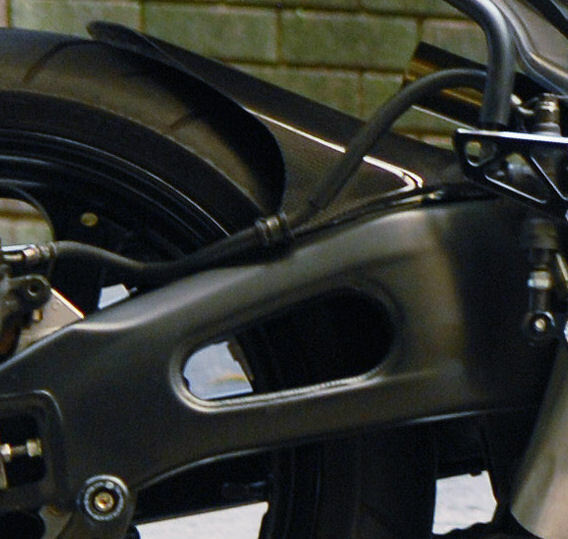 Hondas that have a black swing arm..
2003 CRB600F4.. but the clamps mount from the side. Last edited by E.Marquez; 02-13-2014 at 06:41 AM. Are you referring to part #2? I think that is a metal clamp? Last edited by E.Marquez; 02-13-2014 at 06:58 AM. Those may work i spose. They just an olive oxide zinc plated steel. I dunno why they use those instead of plastic. You could color all the things you want with a black permanent marker while they're on the bike. Saves a lot of time. Or make one out of black twist ties and just be careful when you're bolting it down. Then it's metal and you don't have to worry about inferior ace hardware plastic failing. Or use some black epoxy for a clean efficient no fastener approach! I guess i'm a bit more **** and particular about my bike than others. I've spent a lot kf time and money trying to achieve a certain look.. I hold together my bike with yellow duct tape and if that's good enough for me it's damn well good enough for all you prissy pants types who are worried about bogus things like "attention to detail" and "safety"
What ever works for you..
Oh, and molded is a process, not specific to just plastic.... So if'n you wanted plastic.. perhaps say that. Ok I get it you want an OEM look, but in black.... Do you have any bike wrecking yards near? It's actually metal retainer with a rubber grommet inside, much fancier than the stock plastic clips that hold the rubber against a piece of metal and the sharp plastic edges of the stock retainer. Last edited by sailorjerry; 02-13-2014 at 02:04 PM. Those rock a bit of ***. What are they? Hell Im ordering two of those and I don't even know what I'll use them on next. Pro taper cable guide it looks like. I just bought the $3 pack of Ace 1/2" cable clamps just to spite all y'all and they work money. Couldn't take a picture because my phone is being a stubborn ***** but the are gen-u-ine Chinese plastic and hold that cable like an overly attached girlfriend in heat. Seriously, though, they work pretty well. And look pretty nice. But the factory "don't twist me" location hole is open so that has to be dealt with. I'll get a pic this weekend. The price of the Pro Tapers rocks very little ***. Sorry not up on Hipsterpunkemo speak.. What is "rocks very little ***" in english please? The ProTaper clamps look nice. Great find! Thanks for another good thread! Nevermind, these things are balogna. One time use only because if you try to screw them down twice they give up and snap in half. I don't know whose cheap idea these were in the first place, but definitely not worth it. Last edited by 7moore7; 02-22-2014 at 12:35 PM. Quick Reply: Black rear brake line clips - ?? ?